Home » Economics » Investing » Is the Chinese Stock Market Bubble Bursting? If you’ve been following my posts for a while you’ve probably read my thoughts on the Chinese stock market (two quick reminders for the ones that haven’t are attached at the end of this post). One of the topics I constantly wrote about come 2008 was the Chinese stock market and the high price levels it had attained. 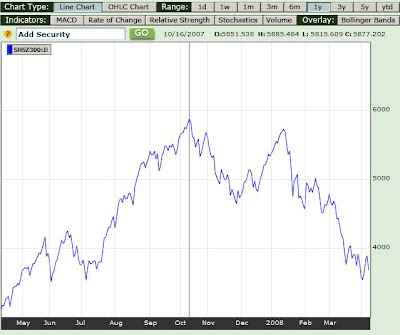 High inflation and interest levels combined with a less than perfect stock market (mildly put) brought me, as it did many others, to believe the 2008 will prove to be a turning point for the Chinese market. High hopes were placed on the Olympics to stabilize the system but as every novice game theorist knows when a premise like that is common knowledge than each individual always has a dominant strategy to go and sell a bit early to avoid the mass sales to follow. I’m guessing that’s what’s happing, amongst other things. I wrote before, and I think it is still obvious, the Chinese market has every reason to become a great invest in the long term. But what we’ve seen so far has been a serious overshooting in stock prices compared to potential growth.